If you don’t find information about low budget hotels in Dubai, traveling in Dubai will cost you a lot. At worst situations, you can even pay double for a hotel that you can actually pay only half. It is better to know about the budget hotels if you don’t want that to happen. If you don’t care about the price tag then we have also discussed top 10 most expensive hotels in Dubai as well. We have discussed below, some of the low budget hotels in Dubai under US$100. These hotels provide quality accommodation & facilities to their guests as well. Read on to find out which budget hotel you’re going to book for your stay in Dubai. Address: Al Riqqa Road, Apposite Al-Ghurair Shopping Mall, Diera, Dubai, United Arab Emirates. The Landmark Grand Hotel is the first hotel in the list of low budget hotels in Dubai. It is located near the airport and is a 4 star hotel, so you won’t be lost or you won’t have to be bothered to look for transport. You can get all the facilities only by spending as much as $80.71 per night. Total number of rooms is 174. It is better to book a room a long before it is already reserved. Amenities include café or coffee shop, salon, fitness centre and a computer station. Breakfast is also available, but with an extra charge. There is a free beach shuttle if you want to go to the beach, so you don’t have to spend on transportation to beach. Address: Al Maktoum Road, Dubai Creek Dubai, United Arab Emirates. 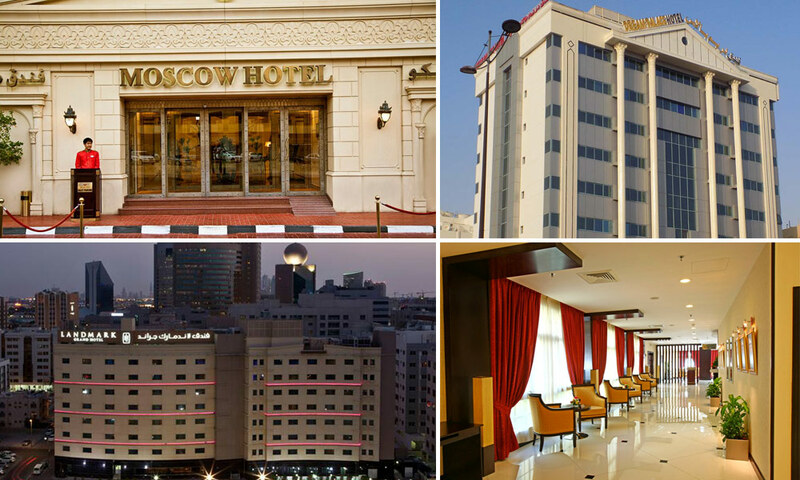 Located near Diera City Centre, Al Ghurair Centre, Burjrman Mall and Dubai Museum is Moscow Hotel which is a strategic one. Moscow hotel offers you free breakfast unlike Landmark Grand Hotel. A babysitting or childcare centre is provided by the hotel, so don’t hesitate to leave your babies or toddlers. Address: Riqqa Al Buteen, Deira, Dubai, UAE. The Rainbow Hotel is just an 11 minute walk from the metro station, 10km from the Dubai Mall and just 2km from the Dubai Museum. The warm and beautiful rooms offer modern décor, Wi-Fi, minibars, sofa beds, Flat-screen TVs. Room service is also available 24/7. It costs $49.51 per night to stay in this low budget hotel in Dubai. The Dream Palace Hotel offers a total number of 147 rooms and costs $51.61 per night. It is a 3 star hotel budget hotel which is located in Dubai Deira Commercial district and is only a 9 minute walk from Al Ghurair Centre Shopping Mall. Amenities include minibars, coffee making facilities, flat-screen TVs, along with sitting areas. It also includes an understated restaurant, a low-key coffee shop, a pool table and a fitness centre. Wi-Fi is free and room service is also provided. Address: Omer Bin Al Khatab Road, Deira, Dubai, United Arab Emirates. The Fortune Pearl Hotel is a 3-star budget hotel in Dubai with 131 rooms in total. It is only 8km away from Dubai International Airport. It offers simple rooms with free Wi-Fi facilities, flat-screen TVs and minibars. Separate dining/living areas and Suites offer the facilities of tea and coffee making. 24 hour room service is available. If you want to stay in a budget hotel near airport then Fortune Pearl Hotel is recommended. Address: Al Nahdha Street, P.O Box 26888, Bur Dubai, Dubai, United Arab Emirates. The total number of rooms in Admiral Plaza Hotel is 142 and is a 3-star hotel. It is located along a lively commercial street in a modern building. It costs about $52.81 per night. This classy hotel is just 6km from the Dubai World Trade Centre and 11km from Burj Khalifa Skyscraper. The rooms provide free Wi-Fi and other facilities such as a satellite TC, mini-fridges, sofas and coffee and tea-making facilities. Room service is available all the time. Address: P.O Box 2603, Al Wasl Sports Club, Jadaf Area, Oud Metha, Dubai, United Arab Emirates. The London Suites Hotel is a 3-star budget hotel in Dubai and costs $54.18 per night. The total number of rooms is 33. It is just 10km from Burj Khalifa Skyscraper and 5km from the Dubai World Trade Centre. It offers sophisticated, warm and comfortable rooms with floor-to-ceiling views. It also provides the facilities of free Wi-Fi, satellite TV and minibars as well as safes and sitting areas. Room service is available all the time. Children of the age 4 or less than 4 can stay for free. Parking is complimentary. The strategic location of this hotels makes it one of the recommended low cost budget hotels in Dubai. It costs only $54.44 per night to stay in Landmark Plaza Hotel and the hotel has a total number of 120 rooms. It is a 3-star budget hotel which is opposite to bustling Baniyas Square in Dubai. It is a very elegant tower hotel with an Arabic traditional façade and is just a 2 minute walk to the nearest metro station. It offers the facilities of free Wi-Fi, flat-screen TVs, mini-fridges and 24/7 room service availability. In some accommodations, smoking is permitted. The Ramee Rose Hotel is a 4-star budget hotel in Dubai and costs only $56.99 per night. It has a total number of 126 rooms. It offers upscale rooms which feature floor-to-ceiling windows and offers free Wi-Fi facilities, flat-screen TVs and minibars. Coffee making and tea making facilities are also available in some suites. Room service is 24/7 available. These are some of the low budget hotels in Dubai, that will cost you less than $US100. If you have stayed in one of the above mentioned budget hotel or would like to recommend one, please add comments below.